Over the last seven years, Jens Müller has been collecting and compiling modern logos created from 1940 to 1980. As Müller puts it, this was the golden age of the modernist aesthetic in design, architecture, art, product design. And to a point he is right. Some of the most visually memorable brand marks and logos come from this four decade period. Müller’s collection is what makes up the content of Aachen’s 6000 page tome Logo Modernism. The book covers pretty much every business and organization of note, and represents a sweeping retrospective modernism and how the style changed over time. Broken into specific sections the book’s main chapters cover Geometric, Effect, and Typographic. 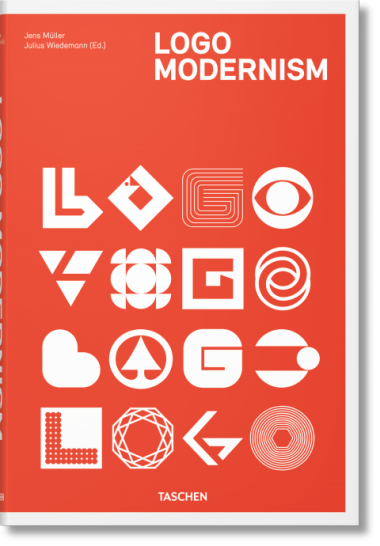 Each sub-chapter breaks down each style even further into sections such as dots and squares, overlays, alphabet, color, etc.The book features an introduction from Jens Müller on the history of logos, and an accompanying essay by R. Roger Remington on modernism and graphic design. In addition there are series of designer profiles on masters of the craft Paul Rand, Yusaku Kamekura, and Anton Stankowski focusing on their legendary work. In typical Taschen heritage, the book is physically huge. at 10 by 14 inches in size and 432 pages of content. And as always from Taschen, the book is multilingual. It’s available for pre-order and this just made my list of books to add to the reference library. Oh and it’s affordable. Just $69.00 on the Taschen site. Posted in Books, Design and Art and tagged Book Design, Color, Design, Form, Graphic Design, Logo Design, Logos, Modern Masters, Modernism, Shape, Taschen, Typography on October 14, 2015 by Author.